It would probably be much simpler and easier to handle all those movements with an index investing strategy than buying individual stocks like we do. Nonetheless, we will stick to our horses as we consider there’s a premium to index investing. In our case, that premium can be quite high as it currently falls in the 4-5% range. For instance, it was 4.73% last time we precisely calculated it. 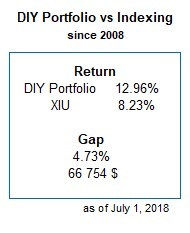 We crudely compared our actual DIY Portfolio performance to investing to same amounts in XIU from 2008 to 2018. We know our comparison is basic and you could probably do better indexing just a little more elaborately. The results would be completely different if, for instance, you just throw in a US index fund (like XSP or XUS) in the mix. But that’s the way we used to do it before investing ourselves and it accurately measures how much we improved on it. One day, we’ll take time to do some computing and obtain a better comparison, or at least, one probably much fairer. We realize that premium may not be as important for you depending on how well you could fare as a DIY investor. We also know there’s no guarantee we will do as well in the future. The cost of index vs DIY investing may even be negative for you and/or us in the coming years. But we like handling things ourselves and are still willing to take on that risk. 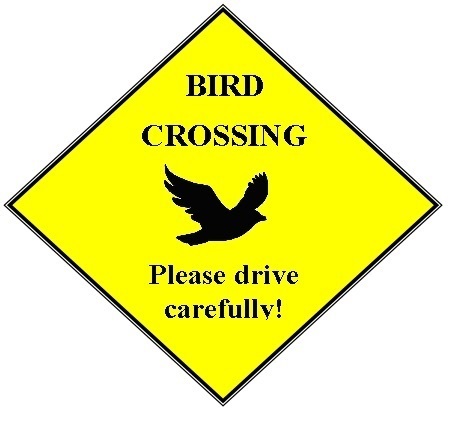 The only thing that would discourage us would be if it becomes too time consuming. So far, our DIY investing career has been quite amazing. We have our ups and downs but all in all, we tend to make sensible decisions and are very proud of our long-haul record. We were probably lucky at times and still are. It may be a little pretentious, but we like to think experience has allowed us to refine our technique over the years. For one thing, we really enjoy using our Dip Factor tool to identify, relatively speaking, the most interesting bargains of the moment. But let’s be honest, successful DIY investing cannot only be resumed to buying stocks on sale. Our improved method includes adjusting the acceptable dip level that triggers a buy. It will be influenced by market conditions (for instance, falling vs rising market) and how much investable cash is sitting in our DIY Portfolio. Along the same lines, we occasionally adjust our cash target allocation. For instance, these days, because markets are and have been for a while on a bull run, we keep a little more cash on hand. We will reduce our cash allocation when bearish conditions show up again. We said when not if, because changing market conditions is a reality you have to accept. We also take upcoming withdrawals and transfers into account. We want to avoid being forced to sell stocks, especially if the suddenly stumble, to have access to liquid funds. So, some minimal planning is required. Furthermore, deciding WHICH stocks are interesting is probably even more important than knowing WHEN to buy them. As we already talked before, in our quest for the optimal stocks, we like to Evaluate Stock Potential using Long-Term Chart. 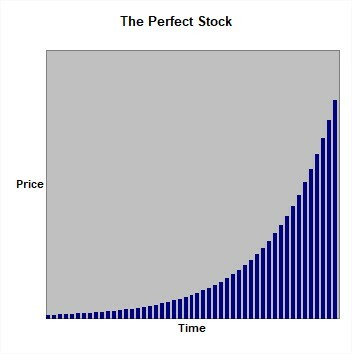 That way, we grade stocks by comparing them to the « perfect stock ». We won’t elaborate about it, but even though we never discuss it here, we evidently also use standard financial metrics to pre-screen all potential stock candidates. Our DIY Portfolio is already built up and mature, so we should limit or even avoid new candidates altogether. Because significant amounts will continue to make their way in, it still won’t feel like just maintenance mode. In fact, we will approach this phase as if we had to invest in a brand-new portfolio again. But we will restraint our choices to stocks we already possess. It will be like using a stock screen composed only from our existing positions. In the next few months, we will invest some time to clearly identify our acquisition candidates in advance. We want to be ready to pull the trigger when they falter and fall under pre-set attractive levels. Another key concept we rarely discuss is asset allocation. We still frequently apply that crucial investing notion to guide our buying and selling decisions. Canadian investors like us have to be careful about being too concentrated in financial or resource stocks as these sectors are over represented in the Canadian stock market. By nature, we have mostly shied away from resources but since the start, Canadian big banks played a major role in our DIY Portfolio. They have served us well over the years and despite bringing some turbulence, are now a solid reassuring presence for us. Asset allocation brings us discipline to limit our exposure to financials. We always try to keep the financial sector around 25-30% of our overall holdings. Using the asset allocation concept can give you an idea on which stocks or which sectors you should be buying or selling next. Like for us with financials, it can allow to avoid being overexposed and help you keep some sense of balance in your portfolio. But on a constant basis, chasing the perfect asset allocation is tricky. It’s like pursuing an everchanging status or goal. The stocks or sectors you need to achieve your ultimate asset allocation are most likely not the ones proposing the most attractive prices or entry points. In that sense, we are not fans of precise or exhaustive asset rebalancing. So, we won’t systematically rebalance our positions every year or even every quarter like some investors do. We consider it too time consuming and costly as it will often ramp up transaction fees. So, our application of that fundamental notion will be much more flexible than it would be for many others. Despite the fact it mostly deals with plain numbers, we don’t view asset allocation as an exact science. Deciding which portion of your portfolio you will allocate to a specific sector will always be somewhat arbitrary. For instance, someone may choose to allocate 30% to financials and the investor next door only 25%. That 5% gap won’t necessarily make a difference after all is said and done. The fact both generally use some form of asset allocation matters much more. As we already said, asset allocation should help maintaining proper diversification, avoiding a specific stock or sector occupying a too large chunk of your portfolio. Indirectly, asset allocation will also help you keep up with another fundamental principle of successful investing: the classic yet simple: « buy low and sell high ». In that regard, aiming for your balanced or desired asset allocation, should unknowingly result in you buying stocks from falling-behind sectors and selling from soaring ones. 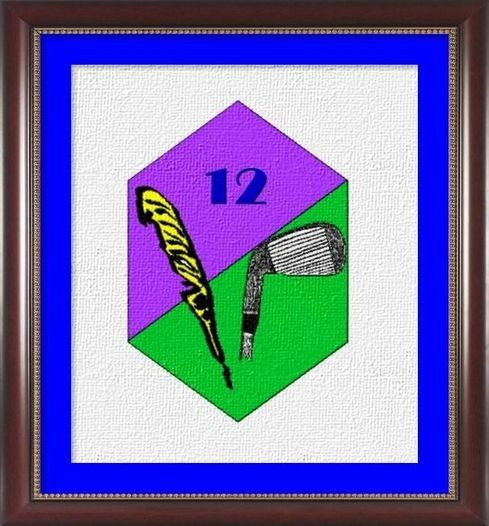 We prefer buying but selling a portion of our winners may not be a bad idea now that we are approaching retirement and are more in a withdrawal mode. We try to anticipate withdrawals at least a year in advance. An important chunk will simply come from dividends and we will sell a portion of some of our winners to cover the rest. Like our investing style, our asset allocation is quite conservative as we presently devote 20% to the Public Services sector and 30% to Basic Consumer Goods & Services. We are a tad more aggressive with Financials at 25%. The remaining 25% is spread among other sectors where we still almost entirely dismiss the more volatile ones. 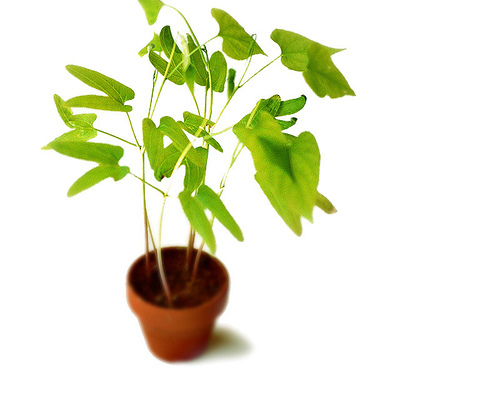 You will note that we treat all our different investing accounts as one. It would be too difficult and it would increase transaction costs to maintain proper diversification and allocate money to all sectors in every account. Oftentimes, when a lot of cash flows into your investing accounts, you may be tempted to settle things right away and immediately try to get back to your desired asset allocation. In that context, blindly buying additional shares all at once may not be the best course of action as these stocks may end up being too expensive. You can always prepare yourself well to acquire supplementary shares but should never act on it hastily. As you know, we always seek to purchase stocks on substantial declines, that’s the main purpose of our Dip Factor tool. Our strategy may look like some form of market timing but it’s not at all what we are trying to achieve. We still believe time in the market is much more important than timing the market. By delaying some purchases, we rather are seeking to increase our margin of safety while obtaining more of our favorite stocks. Hence, we will often spread the process over several weeks or even months. In the stock buying realm, patience really is a virtue, yet it has its rewards. We know, it can sound very boring. Talking about boring, we will also continue to privilege solid steady corporations. With a bigger portfolio, you may be inclined to risk a little more or at least, to be more aggressive with your new acquisitions. It’s fine to take a shot from time to time but we should mostly stick to our boring conservative yet successful investing style. Heck! We are very contempt with boring but profitable! We continually try to look for steadiness over volatility. Our stock grading system reflects that. You could say that in investing as in school, we’ve always liked good grades. So, while buying stocks, we’ll constantly have in mind to maintain or improve the average grade of our DIY Portfolio. Hence, after reviewing grades in the coming months, we will privilege stocks on top of our grade list. To maintain proper diversification, we’ll still make sure any single stock doesn’t become too heavily represented in our holdings. With our somewhat mature portfolio, the critical portion that we now limit any stock to is about 6%. As we said before, we rarely sell unless withdrawals are coming up soon. Not acquiring extra shares of those proportionally too big stocks and buying others will still indirectly diminish their relative weight in our portfolio. Fiscal efficiency as always been a major preoccupation of ours. Knowing relevant tax rules and acting accordingly gives access to what we consider easy or free money everyone is entitled to. In that sense, we consider proper fiscal planning equally or even more important than portfolio performance. Unfortunately, our tax system can be complex, especially for average folks, and many don’t bother with all its repercussions. Several subtleties can apply to every specific situation. Consequently, many end up leaving a lot of money on the table or in the hands of the governments. In the investment realm, broadly knowing the differences between RRSP and TFSA may not be sufficient. For instance, registering your holdings in an RRSP or withdrawing funds from it will influence your taxable income. Naturally, it will affect taxes you pay on your income. But in addition, it may have indirect consequences on fiscal and social measures that are also based, at least partially, on your taxable income. Just to name a few, the Canada Child Benefit, GST/HST credit or even the medical expenses tax credit. On top of it all, these impacts will also vary depending on your province of residence. When retirement years come, other complicated considerations will tag along like the Old Age Security clawback that start to take effect when your income goes above a certain level (75910$ in 2018). As we just said, tax and fiscal issues can regrettably be very complex. Probably too complex but that’s another debate. The good news is despite you and I are not being tax experts, we are still the best person to analyse our own unique situation and consider these sometimes-elaborate tax implications. In that sense, you are not necessarily required to master every fiscal intricacy, you only need to be well informed about measures that are relevant to you and your family’s situation. Don’t hesitate to consult tax professionals but just remember you are the only one to truly have your best interest at heart. The other good thing is, contrary to stock performance, most of the time, fiscal savings are guaranteed. So, surely saving 10% on your taxes is much more interesting than only possibly getting it from your portfolio. In our situation, our main fiscal strategy recently has been targeting a taxable income just under the lower tax bracket upper threshold. In our current leave-of-absence and soon pre-retirement years, it means withdrawing some funds from our RRSP. We are doing this despite the fact it will raise our taxable income a little, hence increasing our actual taxes and penalizing us on some benefits. We consider the relative tax cost and all its repercussions would be much greater withdrawing these RRSP funds later in retirement. Again, we insist that this may only be true for us, in our specific situation. You will also note that going out of RRSPs will not necessarily mean going out of stocks. Planning on other sources of income being sufficient most of the time, a major portion of our beloved stocks will probably just be held, within contribution limits, in our TFSAs instead.